With this launch, Dell has enhanced Inspiron, XPS and Vostro portfolio and it is also expanding its monitor portfolio. The new Inspiron 7000 2-in-1 family comes in 13, 15 and 17-inch sizes. Dell has unveiled a new suite of devices at the IFA 2018. With this launch, it has enhanced Inspiron, XPS and Vostro portfolio and it is also expanding its monitor portfolio with the new Dell 27 Ultrathin monitor. The new Inspiron 7000 2-in-1 family comes in 13, 15 and 17-inch sizes. They include Intel 8th Generation U Series processors, optional 4K UHD screens, and a thermal flow to move hot air out through hidden vents for better performance. The 13- and the 15-inch versions have three-sided narrow borders thanks to a new 2.7mm miniaturized webcam. Plus, the 15- and 17-inch versions offer optional NVIDIA GeForce MX150 to boost graphics quality, as well optional Intel OptaneTM Memory to increase single-drive performance. The Inspiron 14 5000 2-in-1 boasts of thermal routing and narrow borders. The two versions of the Inspiron 14 5000 2-in-1, 5481 and 5482, offer new Intel 8th Generation U Series processors. The 5482 2-in-1 includes a USB type-C port with power delivery and display support. Concurrently, the 5481 2-in-1 includes a full-size HDMI port, a full-size SD card reader, two USB 3.1 generation 1 ports, one USB 2.0 port for easy connectivity. The new Inspiron 14 and 15-inch laptops are available in a variety of color options. A USB type-C port provides power delivery and display support, and an optional fingerprint reader is available on the power button. This product comes with features such as up to 32GB of DDR4 memory5, storage options including SSDs and dual drives, optional discrete graphics up to NVIDIA GeForce MX150 Graphics, and an optional backlit keyboard. Dell is enhancing the Inspiron lineup with its first premium Chromebook, the Dell Inspiron Chromebook 14 2-in-1. It gets a 14-inch FHD IPS display and comes integrated with Google applications and ecosystem. It is powered by the 8th generation Intel Core i3-8130U CPU and up to 128GB of onboard eMMC storage, while the USB Type-C ports, standard backlit keyboard and standard EMR pen are added for convenience. 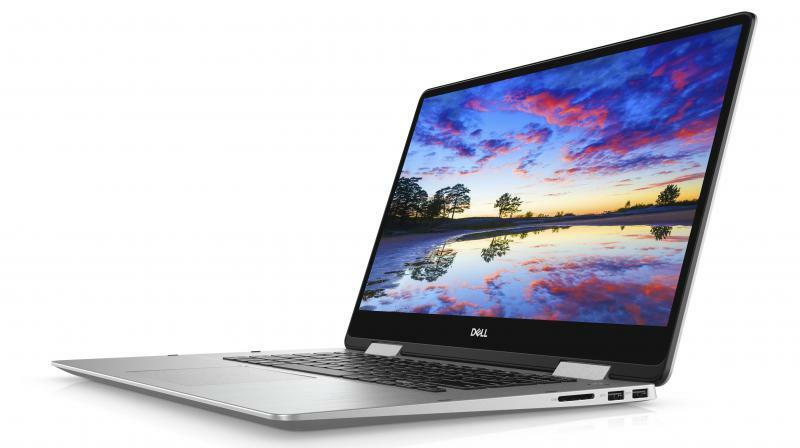 Dell’s flagship XPS 13, the smallest 13-inch laptop now offers the new Intel 8th Generation i3 processor. And the XPS 13 Developer Edition is available now with Ubuntu 18.04 LTS (long-term support), an update that provides support for up to five years. Dell also expands the Vostro lineup with new Vostro 14 and 15 5000 laptops, focused on providing productivity and security features small businesses demand. The laptops include 8th Generation Intel Core processors, USB type-C port that provides power delivery and display support, optional single-sign-on fingerprint reader and two-sided narrow border. Dell also unveiled the newest member of its Ultrathin family and the 27-inch USB-C ultrathin monitor. Featuring up to 600 nits peak brightness, the Dell 27 USB-C Ultrathin (S2719DC) is an HDR monitor with display HDR 600 and integrated with Corning Iris Glass light-guide plate (LGP) technology. It is equipped with a USB type-C connector that transmits video, data and power. Dell has also introduced a new line of SE Monitors with essential features for everyday computing. The new FHD monitors (SE2219H, SE2419H and SE2719H) come with thin bezels and are available in 21.5-inch, 23.8-inch and 27-inch screen sizes. ● Inspiron 7000 2-in-1s will be available on October 2 in US and Canada starting at $879.99 (13-inch), $849.99 (15-inch) and $1,099.99 (17-inch). ● Inspiron 5000 2-in-1 (5482) will be available on October 2 in North America starting at $599.99. ● Inspiron 5000 2-in-1 (5481) will be available on October 2 in North America starting at $459.99. ● Inspiron Chromebook 14 2-in-1 will be available on October 23 in North America starting at $599. ● Vostro 5581 will be available November 9 in North America starting at $579. ● The Dell Mobile Connect update will be available for free in autumn on all consumer Windows 10 XPS, Inspiron, Vostro, and Alienware PC purchased after January 2018. ● Vostro 5481 will be available on January 2, 2019 in North America starting at $669. ● XPS 13 Developer Edition with Ubuntu 18.04 LTS is available now in the US with availability in Canada and Europe coming soon, starting at $949.99. ● XPS 13 with i3 will be available August 28 in US starting at $899.99. ● XPS 13 2-in-1 with Intel 8th Generation processors will be available in the US September 11 starting at $999.99. ● Dell 27 USB-C Ultrathin Monitor is available August 21 in Europe, Africa, Asia and Australia and September 20 in North America, starting at $549.99. ● Dell 22/24/27 SE Monitors will be available September 25 in North America, Asia, Australia, Europe and Africa, starting at $169.99 (22-inch), $199.99 (24-inch) and $249.99 (27-inch).